Oscar J. Agraz, Chief Yeoman, born March 28, 1917, Mexico City, Mexico, graduated high school and studied gas engineering at the University of Kansas. He joined the USN Oct. 15, 1934, and was discharged March 28, 1940. He then enlisted in the USNR Dec. 15, 1941, and was discharged Nov. 29, 1945. Military stations included the USS West Virginia, five and one half years; USN recruiting service; USN Amphibious forces; and Mine Sqdn. 104 on the USS Pickett. Memorable experiences were with the MinRon 104, minesweeping Tokyo Bay prior to USS Missouri entrance and minesweeping the Inland Sea. The mist memorable experience was volunteering for duty on the USS West Virginia after her refitting; he was first sent to amphibs then to mine force, there were no vacant CY billets! His awards include two Good Conduct Awards (Fleet Clasp), American Defense, American Theater and Pacific Theater (Western Carolines, Okinawa and Japan). He and his wife Maxine live in Vallejo, CA, and they have three children and one grandchild. He was employed by the Pacific Gas and Electric Co. as a district gas superintendent. He is a member of the Patrol Craft Sailors Association, Naval Minewarfare Association and the USS West Virginia Group. 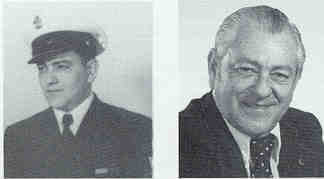 Oscar J. Agraz passed away in December 2001.